Deadlines to motivate me to get something finished! Second, I am thankful to be able to teach classes, and there were some pretty place mats made at a class I taught last week. You can click on any mat to get a better view. Third, I finished the mats I made to demonstrate in class. They’re for two little boys who are learning to sit at the table to eat but are too young to read this post, so it’s safe to show these! Any holiday sewing at your house? 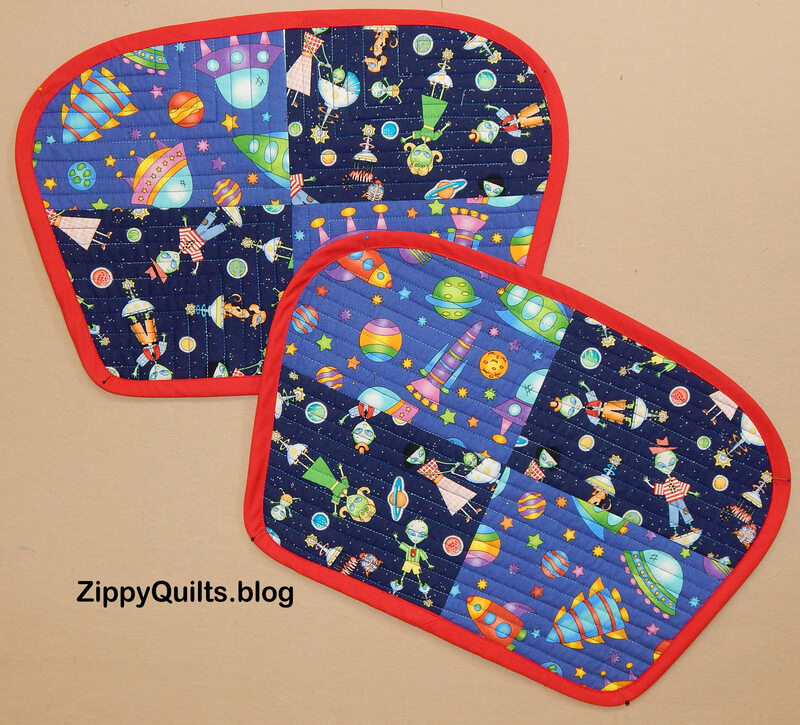 This entry was posted in Modern Quilts, Quilting, Sewing projects and tagged place mats, placemat, quilted placemat, teaching by zippyquilts. Bookmark the permalink. Hi. Merry Christmas Season to you and yours. As usual I enjoyed reading your post and am curious about the last photo. Is it a placemat or mug rug? Something about the shape of it speaks to me. It looks like it would be totally comfy in a retro kitchen. Thanks for sharing. Good Morning, Velda and happy holidays to, too. Those are placemats but I realized after the fact that I had pinned them to the board upside down. The shape is to allow them to fit better on the round table in my daughter’s kitchen. The narrow part should be at the top. Thanks for visiting! Oh my gosh, the little boys’ placemats are so cute! What a great idea! Thanks, Chela. I got the idea from my friend Jerri. And I love your guild member’s comment about being thankful that quilting connects us to past and future generations. So true! Yes, the connection across generations is oiof my favorite things, too. Those are great quilty things to be thankful for! And husbands who can make their own supper can deal with wife quilting marathons – ha! Of course you had to buy that fabric!